Packed & Stacked with Goodness at the Corner! 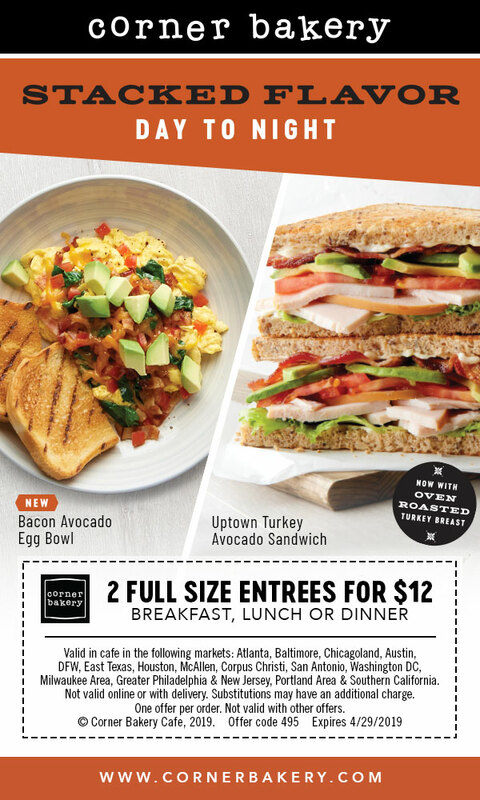 That’s right — get two full size entrees for just $12 from Corner Bakery! Try our new Bacon Avocado Bowl or Uptown Turkey Avocado Sandwich. Offer good for breakfast, lunch or dinner. Corner Bakery $12 Entree Offer valid in cafe for 2 Full Size Breakfast, Lunch or Dinner Entrees in the following markets: Atlanta, Baltimore, Chicagoland, Austin, DFW, East Texas, Houston, McAllen, Corpus Christi, San Antonio, Washington DC, Milwaukee Area, Greater Philadelphia/New Jersey, Portland Area & Southern California. Not valid online or with delivery. Not valid with other offers. Substitutions may have an additional charge. No cash value. Expires 4/29/19. Offer Code 495.